With Ultimate Kilimanjaro, you get high quality service without the inflated cost. Our goal is to work with you to create the ideal itinerary based on your needs, abilities and desires. We can help you plan every aspect of your climb, providing everything you need for a successful summit and enjoyable experience. Won’t you join us on the Roof of Africa? Proven Expertise. With more than a decade of experience, Ultimate Kilimanjaro has a proven expertise on Mount Kilimanjaro. We lead over 150 climbs per year, with more than 1,000 adventurers climbing with us annually. Literally thousands of climbers have stood on the top of Kilimanjaro with us. Our clients have included celebrities, film makers, senators, ambassadors, authors and journalists. Best Guides. Our expert guides were hand selected to work for us. We have the best local guides who have received extensive training in first aid and mountain rescue. With unrivaled experience and competence, they are among the most talented and respected professionals in the industry. Our guides have led 7,000+ climbers to successful summits. Small Party Climbs. A small-party climb is the best way to climb Mount Kilimanjaro. We don’t believe in creating large trekking parties as it detracts from the experience. We strive to create the optimal conditions for a safe, successful climb. Keeping the group size small creates an intimate setting on the mountain, but more importantly ensures proper attention for each and every climber. Focus on Safety. Ultimate Kilimanjaro is focused on safety, understanding that our top priority is to keep you out of harm’s way. Our guides perform regular health checks on all climbers, and they are prepared to prevent, detect and treat altitude sickness. We include rescue oxygen on every climb and have evacuation plans in place in case of emergencies. Quality Camping Gear. We only use high quality camping equipment to keep climbers as comfortable as possible while outdoors. Our Mountain Hardwear tents are warm, waterproof, and roomy – and perfectly suited for the rigors of Kilimanjaro. We provide thick foam sleeping pads for all clients. Mountain Hardwear sleeping bags, rated to -30F/-30C, are available for rental. Delicious Meals. All food and drink is provided on the mountain. Our mountain chefs prepare delicious meals with fresh, local ingredients. These meals are nutritious and calorie dense, specifically designed to sustain the energy of climbers. An ample amount of clean water is provided so climbers stay well hydrated throughout the trek. We also cater to all special dietary requirements. Best Routes. 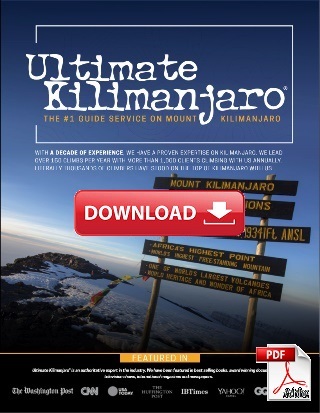 Ultimate Kilimanjaro specializes on Kilimanjaro’s best routes. With many routes to choose from, we avoid trails that are very crowded, less scenic, and have poor acclimatization profiles. We operate primarily on routes that offer a combination of high success rates, scenic beauty and low foot traffic. This ensures our clients have the best chance of reaching the summit and have a good time doing it. Group and Private Climbs. For those who are traveling alone or simply want the company of others, we have scheduled group climbs on our favorite routes. These climbs avoid the rainy seasons, include acclimatization days, and are limited to only 12 climbers. We can also organize private climbs on any route, for any size party, on any dates. Porter Welfare. We take porter welfare very seriously and do our best to ensure our staff is treated well. As a partner company of the Kilimanjaro Porters Assistance Project (KPAP), we comply with all established guidelines on porter wages and welfare. We supply our porters with the proper food and shelter, and restrict porter loads to reasonable weight limits. Leave No Trace. We are a member of Leave No Trace, an organization dedicated to enjoying the outdoors responsibly. Our guides and porters practice Leave No Trace ethics on the mountain so that everyone can enjoy a clean, litter free environment on one of Africa’s most majestic landscapes. The hardest part about climbing Kilimanjaro is making the decision to do it. We’ve all been there. It’s a personal choice that we can’t help you with. But what we can do is answer your questions, and work with you to determine the itinerary that best suits you and your party’s desires and needs. Factors which may be relevant in constructing your itinerary include age, fitness level, injuries, backpacking or hiking experience, experience at high altitude, degree of motivation, and any other special considerations. We have satisfied clients from all over the world, and will do everything we can to ensure that you have the Ultimate Kilimanjaro experience. Contact us (info@ultimatekilimanjaro.com) for more information!